Classic, classy and in a class of their own; the Round Pedestal Teak Tables are versatile and timeless. A stalwart best seller at Teak Warehouse, our Round Pedestal Teak Tables are the perfect choice for both homes and commercial properties. 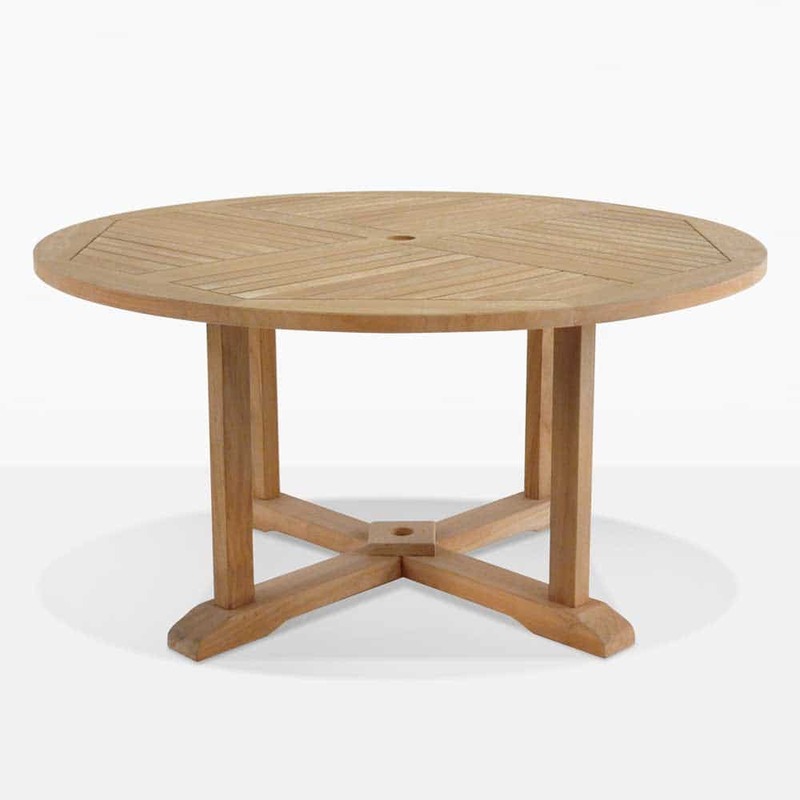 This A-Grade Teak round table is ideal for outdoor dining, complete with a simple and stylish windmill design tabletop, classic pedestal base and umbrella hole. Create a custom A-Grade teak dining collection with teak dining chairs of your choice, or mix and match with concrete, mesh or wicker for an eclectic look. This table comes in 7 sizes so you have options depending on what your space requires. 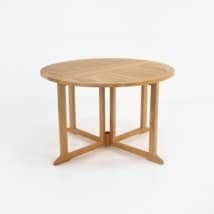 Our Round Pedestal Teak Tables are put together in the USA by qualified builders and made from A-Grade plantation Teak, highly regarded and sought after for its quality and durability. We choose to supply our customers with the top quality of teak because it is proven to last. Teak is graded based on how old the tree is when it gets cut down. With A-Grade, your teak is at least 40 years old, giving it time to have generated substantial amounts of natural oil and rubber which mean that the wood furniture A-Grade Teak turns into is incredibly strong, good looking and easy to maintain for years longer than you’d expect! It also wards off those nasty termites and other wood eating bugs. It is undoubtedly the best type of wood for outdoors. The proof is in our product, our customers keep coming back for more and recommending us. We have been in business for over 20 years because we continue to offer the best quality outdoor furniture at competitive prices. The Round Pedestal Teak Tables are available in 6 sizes! From 27 all the way up to 72 inches, catering to your needs! 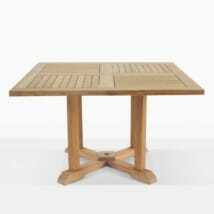 Whether you’ve got a small porch or a huge wooden deck, your specs are met with this stunning teak table. Are you designing for a café or restaurant that needs beautiful furniture for an outdoor courtyard? Sample a selection of our smaller ‘Peds’ and dress with a 7.5 Sunbrella Umbrella in your choice of color and surround each with one of our fabulous mid-century brushed steel and wicker chairs. You and your guests will enjoy this setting that looks like it came right out of a magazine! If you love to have big family dinners, purchase our 58 inch Round Pedestal Teak Table with a Lazy Susan in the middle and a selection of our famous teak folding chairs – with arms or without – for the ultimate dining experience! Dish up a glorious afternoon tea, complete with cakes and scones and dainty cups and saucers in your gorgeous garden. Add this amazing Round Pedestal Teak Table with your favorite teak side chair to your garden area for a solid wood influence that complements the beauty of the rich colors in your flowers and green grass. If you have a large area, add to it with a couple of our teak benches to create a real English country feel. Perhaps you have a industrial roof deck that is screaming for some warmth and comfort to take in the view as you enjoy late night dinners and drinks with friends? Purchase our 72 inch table and surround with a heavy duty teak arm chair with a couple of throw cushions in a bright color for good measure, and you’ve created a sanctuary of stability that you and your guest will love. 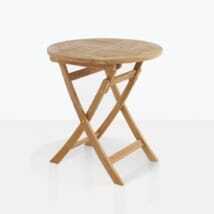 Shown here is our 58″ Round Pedestal Teak Table. 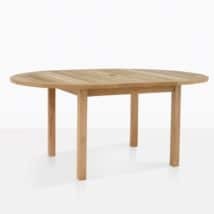 See Dining Tables for the Square version of this same style. Have any questions? Call our 1-800 number now! Our sales staff are on hand 7 days a week to help you with your outdoor furniture needs! Teak Warehouse is proud to provide all of the States of America with marine quality outdoor furniture, whether you’re after a sun lounger, a fabulous, relaxing deep seating set, new dining chairs and tables, umbrellas or relaxing chairs – we have everything you could possibly need! And we don’t just carry A-Grade Teak! Look into the splendid array of other outdoor products for variation and pieces that complement the architecture of your space. 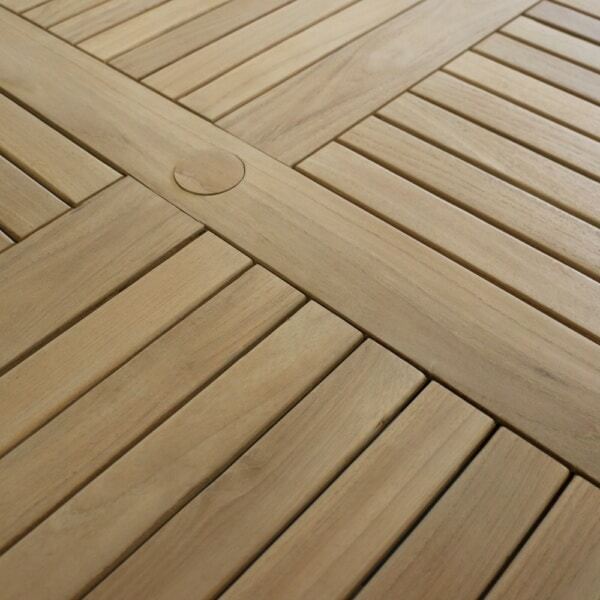 We offer marine grade #316 Stainless Steel, Sunbrella® fabric, Viro® wicker, Concrete, Reclaimed Teak and much more! Our product information page provides information about each of these superb products as well as useful care information. Feel free to call us, we are experts in our product and happy to help you find ideal pieces for your home! Our Round Pedestal Teak Tables are beautiful, robust, classic and yet timeless; pair them up with a great array of different chairs to create looks to complement your personal style as well as your homes flavor!